Stocked with fresh pumpkin puree and having recently made pumpkin pancakes, muffins, and baked oatmeal, my mind turned to smoothies. My first thought was to combine pumpkin and fresh orange juice to keep the color bright and add natural sweetness. But guess what? No oranges. No orange juice either! I went with the coconut option, but I mention my other thoughts because I think they would each provide a little something different yet taste delicious with the pumpkin and other ingredients. Smoothies are the type of thing to which I enjoy adding a little of this and a little of that. If using juice–and depending on personal preference–you may not need additional sweetener. Taste and add accordingly. While I used almond butter this time, you could use peanut butter instead! This recipe was shared with Bobbi’s Kozy Kitchen. Yields 2 servings, approximately 10 ounces each. Combine all ingredients in a blender and blend until smooth. Scrape down the sides of the blender and blend again briefly. Check for sweetness, adding more maple syrup, if desired. Garnish with cinnamon and/or coconut, pour and enjoy! Sounds intriguing! I will have to give this a try Ann. I (unfortunately) took a break from cooking last few days. Not a good thing for my waistine or our budgets.. I still need to get the baked pancakes made and might pick one evening to make them and they will be good to grab for breakfast and heat at work. I made a double batch of this smoothie and had some of the second with my lunch. I had since bought oranges and grated a little orange zest on top. The orange-pumpkin combination really is a good one, so I will definitely have to circle back to my original idea. 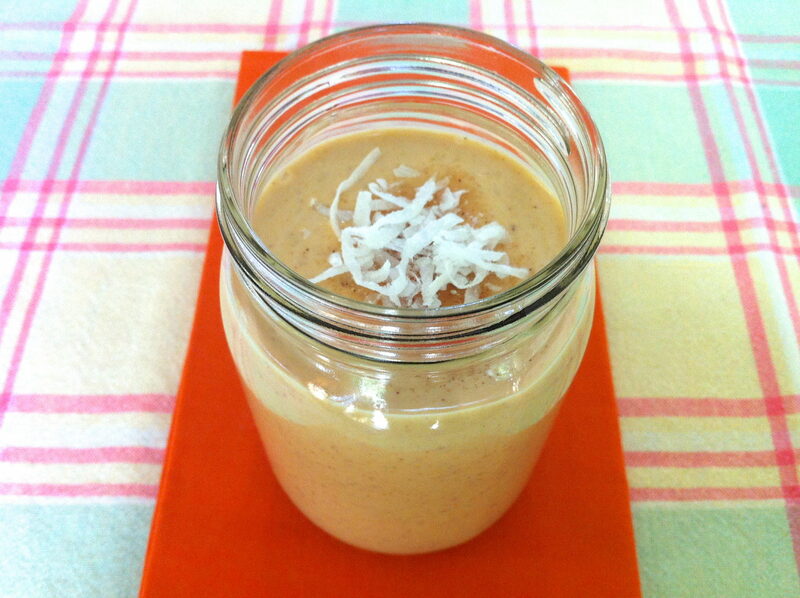 I hadn’t made a pumpkin smoothie yet and really enjoyed it for something a little different. Let me know how you make out with the pancakes!